In this audio e-book short story narrated by Rick Riordan, Carter Kane is investigating rumored sightings of a monster on Long Island when he runs into something else: a mysterious boy named Percy Jackson. And their meeting isn't exactly friendly. . . . Includes a sneak peek chapter from HOUSE OF HADES, Book Four in the Heroes of Olympus series. Praise for "The Son of Sobek"
This is another amazing acomplishment of Riordan I started reading his books at the age of 8. They brought me an amazing world of fantasy. 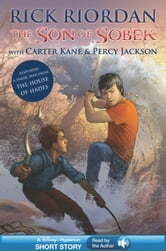 This book is no different and even though i is a short I wold recommend it to ay Riordan fans.